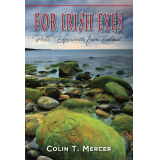 Colin Mercer’s brilliantly insightful poetry, For Irish Eyes: Poetic Experiences from Ireland, is a collection of a man’s experiences, perceptions, and musings. Mercer presents the reader with a treasure of snapshots—from everyday occurrences to joyous, sad, and traumatic events—set among the lush countryside of Ireland. Join him on a walk through the heathers along the coast and experience the sights, sounds and smells where “every morning is delivered new within a package of frosted dew.” Look through Irish eyes to feel a child’s near-death experience, a betrayal of human trust, a soothing conversation with a wise old man at his countryside cottage. Mercer’s verse, peppered with a lively, rhythmic voice, brings vivid imagery to the mind’s eye. As an artist splashes color on a canvas, this poet uses situations as a backdrop and happenings as his palette to present a masterpiece of life experiences, folklore, and legendary tales. For Irish Eyes will become a treasured compilation that will have a permanent place in your library and in your heart. You're probably thinking a book of poetry you? Yes. Yes me, I in fact love this book. Okay, i love everything Irish, but this caught my eye. This is a book filled with vivid imagery and a wonderful sense of imagination and play. What I enjoyed most about this is that it isn't as poetic as some of the peom books I normally read. Of course I did need to read it a few times before putting the review up, my sincere apologies Colin. This is a great book for anyone to read I highly recommend it. Okay, So quickly, published in August of 2009 and you can find it on amazon.uk, on his website you can order the book there, for a bit faster, as 1-3 weeks was very hard, because in reality it's a bit more than 3 weeks to come to Canada! The front cover image is awesome and peaceful and this is one of the finest photos of the Irish coast I've seen in a while. It lives up to the writing inside. Simple elegant and everything on would want in a poetic experience book. I recommend this book for readers and for those who need a great sense of beauty, wild and elegance in a poetic form.